United Airlines has issued an apology for Flight 931, the non-stop flight from San Francisco to London that took to the sky without enough toilet paper for the transatlantic journey. ABC News reports that before the 10-hour trip began, the United crew failed to stock the plane with adequate stores of bathroom tissue. Once in the air, half of the lavatories ran out of toilet paper. Flight attendants were left scrambling, stocking the lavatories with cocktail napkins instead. A spokesperson for the airline issued a statement to The Huffington Post in which they claim stopping to stock the toilet paper supply would have delayed the flight. 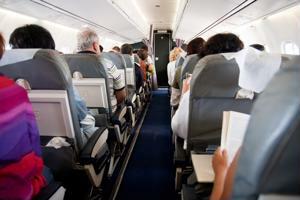 The statement insists that more than half of the nine lavatories were stocked with bathroom tissue for the duration of the flight. United does concede that when the remaining bathrooms ran out of toilet tissue, the crew improvised with paper napkins, and apologized for the inconvenience. "That's disgusting, that's just so terrible," said United passenger Gretchen Holland to ABC. "If I'm paying for a ticket, that should include the price of toilet paper, I would think." Embarrassing as it may be, the toilet paper debacle may not come as a surprise to those familiar with the airline. United has ranked lowest in the American Customer Satisfaction Index (ACSI) for the second year in a row, according to ABC. The company claimed that its merger with Continental Airlines was a contributing factor. Matt Brownell of Daily Finance recalled the ASCI distinction, writing that the most recent incident is an example of United's unorganized customer service approach that has led them to rank dead last for the past two years. He writes that although having to use cocktail napkins in lieu of toilet paper is not the end of the world, it's is hard to imagine an airline like JetBlue - ranked number one in the ACSI survey - having to resort to "college-dorm-style innovation." However, not everyone thinks that the bathroom tissue affair is worth the media frenzy. United passenger Kelly Ames told ABC that in her opinion, the airline did its best to satisfy. She said, "You want to get to where you are going and people have alternative plans and connections. They provided a solution." In a similar vein, travel advice author Edward Hasbrouck from ABC expressed his bottom line. "Which is more important: making your connecting flight or having to wipe with paper towels?" he asked. "Is this a big deal? No."